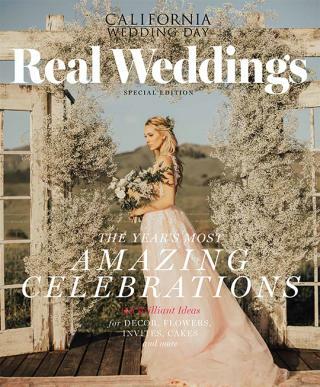 1.Caped Crusader (pictured above): Allison Webb’s elegant “Ellington” cashmere Chantilly lace dress features an A-line cut with a strapless sweetheart bodice, chapel train, and floral embroidery with metallic and opal accents. 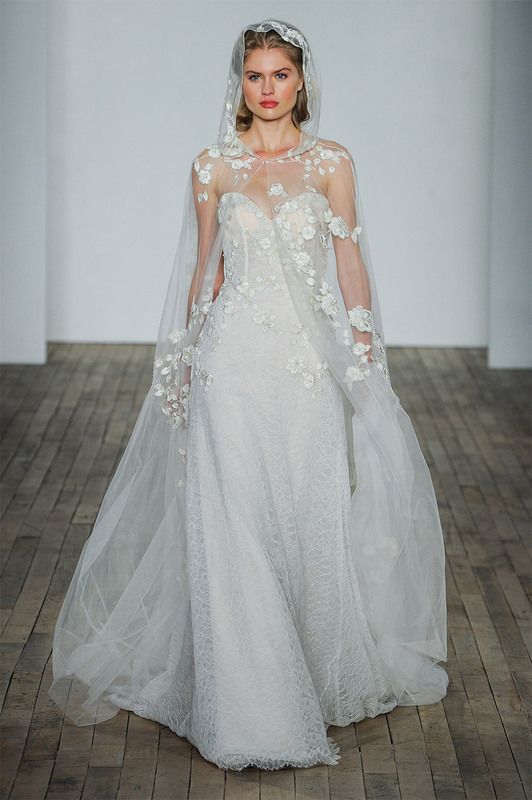 Live the dream by enhancing it with an ivory tulle hooded cape with hand-placed floral embroidery. Dress, $4,975; cape, price available upon request; both at JLM Couture Boutique in Los Angeles, jlmboutique.com. 2. Feathered Friend: Alexandra Grecco’s tiered silk gown is bohemian perfection, adorned with layers of ostrich feathers and accented with a plunging V neckline. Price upon request, at The Dress Theory in San Diego, thedresstheory.com; Lovely Bride in Los Angeles and San Francisco, lovelybride.com. 3. Blushing Beauty: Anne Barge’s romantic “Abigail” dress shows off two trends, bows and blush, in one beautiful design. The gown has a delicate sweetheart bodice with draped gazar bodice and a cascading full-circle skirt with an oversize bow that flows into a train. $2,850, at Kinsley James Bridal in West Hollywood, kinsleyjames.com. 4. 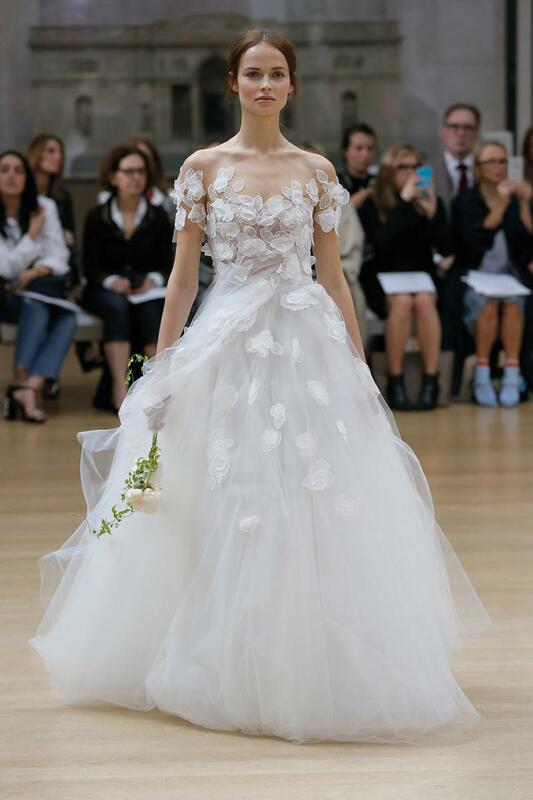 Flower Girl: Waltz into a dream garden wedding in Oscar de la Renta’s ivory tulle confection that features an illusion neckline and three-dimensional floral embroidery. $8,590, at Oscar de la Renta Boutique in West Hollywood, oscardelarenta.com. 5. Training Session: Ines Di Santo’s “Liberty” dress promises a dramatic entrance with its textured train flowing behind a one-shoulder sheath gown, accented by a stunning pearl necklace (included with gown). The detachable train makes hitting the dance floor at the reception a given. 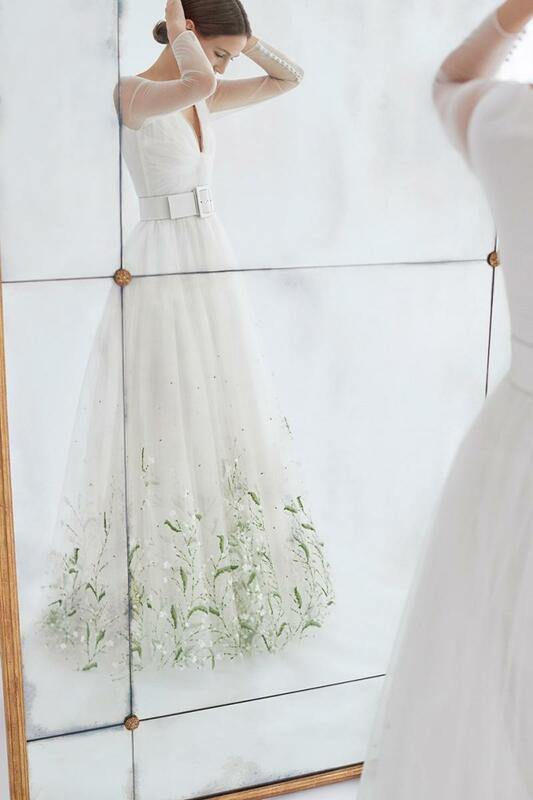 $13,470, Lovella Bridal in Glendale, lovellabridal.com. 6. Belt Way: Delicate and dreamy, Carolina Herrera’s “Gabriella” long-sleeved floral-embellished gown is cinched with a wide leather belt, bringing a modern element to an ethereal dress. $12,990, from Carolina Herrera in Beverly Hills, carolinaherrera.com. 7. Sleeved To Meet You: Channel your inner mother of dragons in Hayley Paige’s “Viva” Chardonnay ball gown with textural warped embroidery, illusion bateau neckline and off-the-shoulder Casanova sleeve. The cascading skirt is embroidered and has horsehair trim. Price upon request, at JLM Couture Boutique in Los Angeles, jlmcouture.com.